Il Casale in Belmont is one of my favorite Italian restaurants in Boston, so I was excited to try the new outpost in Lexington which focuses more on the "Neapolitan street food, baked pasta and authentic seafood dishes that are prevalent in the Campania region"
Steve's college friend Chris and his wife Tracy were visiting for the day. Tracy generously agreed to take our engagement photos, so we spent the afternoon snapping shots around MIT and Boston. 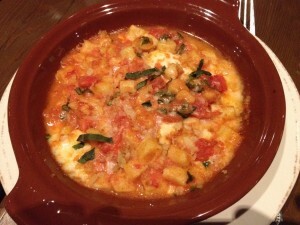 Afterwards, we enjoyed a nice meal at Il Casale. The Belmont location is situated in an old firehouse, with brick walls and lanterns for ambiance; the Lexington site has less original character – but does boost an open kitchen. We also read that a childhood friend of Steve's was the head chef, but it turns out that he was only consulting during the opening. 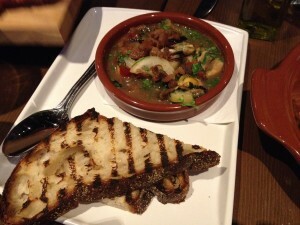 We started with fried calamari ($12), mussels ($12) and bruschetta ($5). 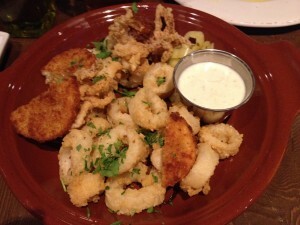 The calamari was excellent, as it always is at Il Casale – lightly fried, crisp, tender and flavorful. I expected the mussels to come in the shell, but this "cozze al marsala" preparation was shelled and sautéed with cured lemon, pancetta, cured tomatoes. I liked the flavors and it was less messy to eat, but I missed the trough of mussels. The grilled bread was a nice accompaniment. 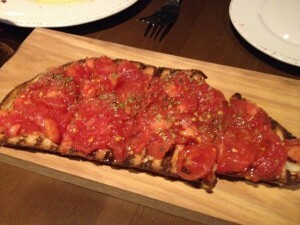 The bruschetta was topped with crushed cherry tomatoes, garlic and oregano; it reminded me of the pan con tomato I enjoyed at Jaleo in Vegas. Steve and I shared the gnochetti alla Sorrentina (little potato dumplings, tomato, basil, smoked scamorza, $16) and the slow roasted pork shoulder ("maiale agli agrumi," citrus, celery root, $25). The gnochetti was inconsistent in size and therefore, in texture as well. Scamorza is an Italian cow's milk cheese, similar to mozzarella. The tomato sauce was simple and bright. The pork shoulder was excellent - meltingly tender, no knife required. 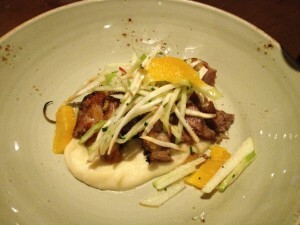 The celery root puree was creamy and smooth and the orange supremes added a nice acidic note. It was my favorite dish of the night. 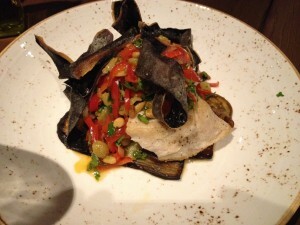 Tracy got the gnochetti alla Sorrentina for her entrée and Chris got the eggplant and swordfish special. They both seemed to enjoy their meals. 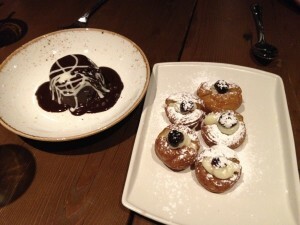 For dessert, we shared the torta al cioccolato (chocolate mousse cake, $10) and the bocconcini di San Giuseppe (cream filled fritters, amarena cherries $10). The cake was good, but the fritters were amazing. They were fabulous little bites of fried dough that were filled with a luscious pastry cream. Yum. Our service was good, and parking is easy. I think that I would probably pick the Belmont location over Lexington for the ambiance reason alone.